Jacob's Crackers: " A Japanese feast ... A Simple Art "
Discovering the essence of Japanese Cuisine doesn't rely only with it's emphasis on simplicity , a balance of textures, flavours & colours or artful presentation , But most importantly, it's in tune with the seasons, so as when seasonal vegetables and condiments change, so does the dishes throughout the year . It's learning to live and cooking with the seasons and with what is growing and available all around you . The Cooking methods used are very simple and quick, to ensure that the food is never overcooked, but that the flavour is sealed in and that it remains as close to it's natural state as possible . In fact , raw food plays an important role in Japanese Cuisine . From Slicing ( sashimi ) , Grilling ( yakitori ) , Simmering ( miso soup , ramen or dishes cooked in a broth ), Steaming ( delicate egg dishes , tofu , fish & vegetables placed on kelp leaves ) , Hand rolling ( sushi ) , Frying ( tempura ) to Pickling ( vinegared salads & pickles ). 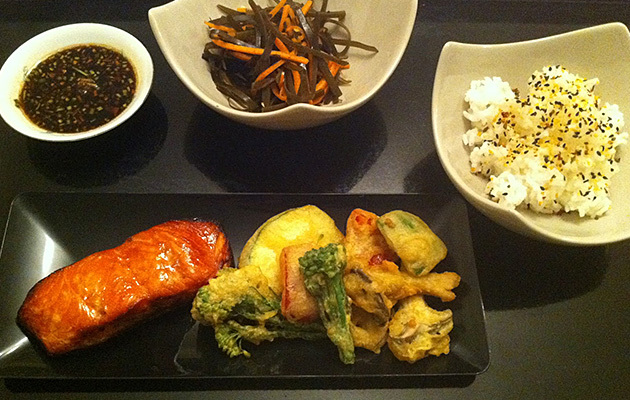 But there are a few basics that form the foundation of many Japanese dishes . They are Dashi stock and Kelp stock . 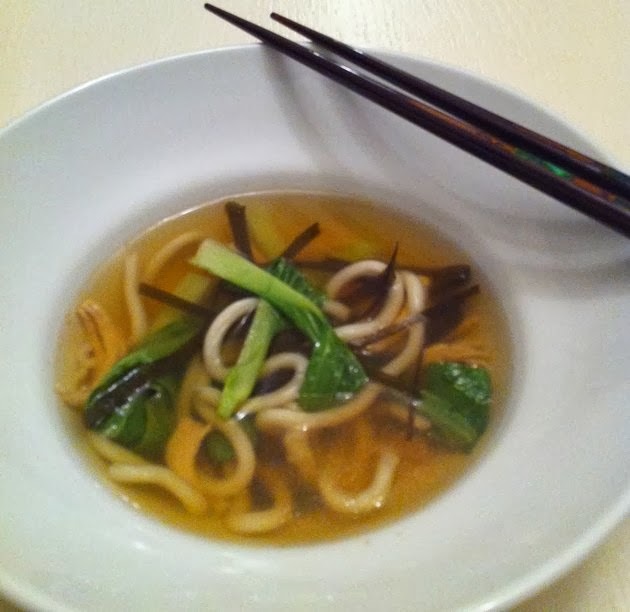 They are also the base for Miso soup , Udon and Soba Noodle Soup and Ramen and Ponzu broth . Wipe the Kombu seaweed sheets with a damp cloth , Cut in half and half again . Place in a jug and cover with 4 mugs of cold water and allow to infuse overnight . Pass the stock through some muslin the next day to get rid of any impurities . The stock should be a clear golden liquid with a faintly sweet and salty taste . To make the Dashi Stock , Place the Kombu into a pan , cover with 4 mugs of water. Bring to a gentle simmer on medium heat and allow to simmer for 15 mins . Add the Bonito flakes and turn off the heat and allow to infuse for 5 more mins . Pass the stock again through muslin . Reserve the Kombu kelp for a Wonderful Vinegared Salad . This stock will also be a clear golden liquid , a slightly deeper shade and with a saltier taste . Use both stock within 3 days or freeze for later use . Wash the kelp in cold water , slice into thin julienne . Cook with the carrots , water , soy , vinegar, sugar on low heat until most of the liquid has been absorbed . Finish with the dried chili flakes . Bring the broth to a gentle boil , add the chicken and allow to poach for 5-6 mins. Skim off any foam . Add the mushrooms and simmer for 1 minute. Add the noodles and the kelp . Finish with the pak choi and season to taste with the white pepper & soy . 1 small piece of kombu kelp . Put the rice in a pot , add the water , slash the kelp to allow flavours to be released more freely and place on top of the rice . Cover with a lid and bring to the boil . Allow to boil for 30 sec. Remove the kelp , and with the lid still on , cook on the lowest setting until all the water has been absorbed. Turn off the heat. Allow to stand and with the lid wrapped in a kitchen towel for 10-15 mins. Spread the rice in a shallow tray , and with horizontal cutting strokes , toss the rice while sprinkling with the vinegar dressing and continue fanning to cool it quickly . Pre heat your grill . Make the marinade by mixing all the ingredients and mix well until all the sugar has dissolved , Bring to the boil and allow to cool . Place the salmon darnes in the marinade and set aside for 30 mins . In lightly greased frying pan , fry the salmon fillets , skin side down to crisp up the skin . Transfer to a tray , spoon on some of the marinade and grill until cooked it has a glossy and caramelised glaze . Takes only a few mins and your salmon should be pink and moist in the middle . The secret to a good tempura batter is not to make it in advance as you should not allow the batter to stand . Make it just before you are ready to begin frying . Do not over mix the batter either , it should be lumpy and marked with lumps of dry flour . Keeping your oil at a constant temperature will also ensure even frying . Make sure all the vegetables are thoroughly dry . Then lightly dredged in flour and then dipped into the batter . Lower into the hot oil with care and the goal is to obtain a lacy golden & crisp coating . Garnish with deep fried seaweed . Heat the oil and fry quickly the garlic & ginger. Add the other ingredients , bring to the boil, whisk for a mins until thickened and smooth . Take off heat and allow to cool . Garnish with the spring onions before serving .